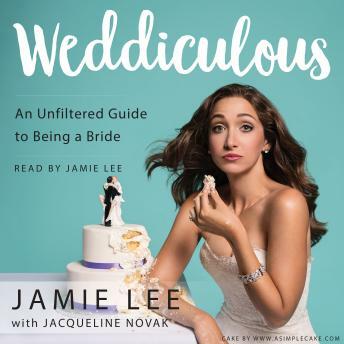 In this irreverent wedding guide, MTV's wedding planning guru and star of Girl Code, comedian and bride-to-be Jamie Lee, offers practical advice and hilarious insights on how to stay sane while planning your "big day." Weddings. What was once a beautiful celebration of a couple coming together for a lifetime of happiness has become a bit ridiculous, complete with the whimsical monogrammed mason jars and unconventional photo shoots. The Epic task of creating that special event can be nightmarish, a dizzying maze of minutiae and seemingly endless choices that might tempt you to say yes to a quickie drive-through chapel in Vegas. But weddings don't have to be stressful. You don't have to give in to the crazy or give up completely. Famous funny gal Jamie Lee learned much more than she counted on pulling together her own wedding, and in Weddiculous she shares her first-hand experiences and hilarious hard-won insights with every girl who just said "yes." Jamie gives you the real low-down, puts the madness into perspective, and walks you through the process step by step in a calm, realistic, and highly entertaining way. Weddiculous includes helpful checklists, timelines, and suggestions on everything from what questions to ask vendors to how to handle difficult bridesmaids to what's worth the extra cost (and more importantly, what's not). Throughout, Jamie provides guidance on when you should trust your gut and when you need to listen to others. What Amy Sedaris has done for hospitality and crafting, Jamie Lee now does for weddings. Weddiculous will help remind you what's really important about your wedding day: it's just the first day in a long and happy marriage. Not worth the time. Not funny, even though the author is a comedian. Skip this one! I really liked this book. I have been married for many years however I found the treatment of this subject matter refreshing. Jamie Lee is funny and a little irreverent. Jamie's narration was easy to listen to. The chapters went by quickly. I'd recommend giving this book as a gift to anyone about to get married. Some of this book was a humorous break from the madness known as wedding planning. The wedding market can indeed be ridiculous so I commiserated with much of what Jamie Lee had to say, but she also lost a great deal of my respect when she 1) shared her own personal wedding budget (as someone who gave in to the ridiculousness and 2) criticized all versions of creativity. She reinforced the belief that every person is going to criticize your wedding and some way so do whatever you want that makes you happy and don't listen to the critics. Her "Big Bridal" voice started to make me cringe as I listened further into the book. Some of the "big bridal" recommendations are silly and outlandish, but some of Jamie's are as well. Take this book with a grain of salt. I also would have appreciated a way to skip certain chapters or return to ones that rung truer with me.